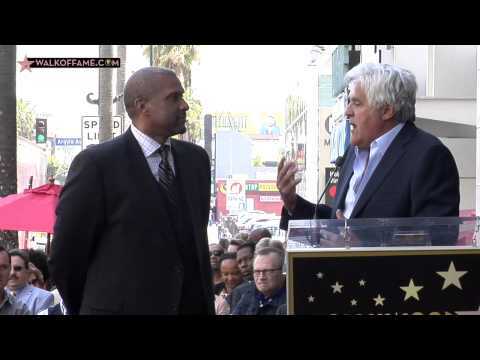 Emcee Leron Gubler, President & CEO of the Hollywood Chamber of Commerce and guest speakers Larry King and Jay Leno were on hand to unveil the star for Smiley, the 2,522nd star in the category of Television at 6270 Hollywood Boulevard. Guests included Walk of Famers Dave Koz and Ray Parker Jr, family and friends. The star ceremony was streamed live exclusively on www.walkoffame.com. Smiley was born in Gulfport, Mississippi. His family later moved to Indiana and he went on to attend Indiana University. Subsequently, he moved to Los Angeles to serve under Mayor Tom Bradley before venturing into broadcast media. From his celebrated conversations with world figures to his work to inspire the next generation of leaders, Smiley — broadcaster, author, publisher, advocate, entrepreneur and philanthropist — has emerged as an outstanding voice for change. He is currently the host of the late-night television talk show Tavis Smiley on PBS, as well as The Tavis Smiley Show from Public Radio International (PRI). In addition to his radio and television work, Smiley has written 16 books. His memoir, What I Know for Sure: My Story of Growing Up in America, became a New York Times best seller, and the book he edited, Covenant with Black America, became the first non-fiction book by a Black-owned publisher to reach No. 1 on The New York Times best-sellers list. He also co-wrote the New York Times best seller, The Rich and the Rest of Us: A Poverty Manifesto. His forthcoming book, to be published in September 2014, is Death of a King: The Real Story of the Last Year in the Life of Dr. Martin Luther King, Jr.
Smiley was the presenter and creative force behind AMERICA I AM: The African American Imprint. This unprecedented traveling museum exhibition, which debuted in January 2009, toured the United States for four years, celebrating the extraordinary impact of African American contributions to the U.S. and the world, as delivered through rare artifacts, memorabilia and multimedia. Many of the artifacts Smiley discovered and displayed during the AMERICA I AM tour are now on permanent display at the Smithsonian Institution. Smiley’s most gratifying accomplishments are rooted in his commitment to champion human rights and empowerment issues, and in his passion to inspire the next generation of leaders. Since its inception, the Tavis Smiley Foundation has provided leadership training and development for more than 6,500 young people through ‘Youth to Leaders’ training workshops and conferences. Expanding upon Smiley’s pervious anti-poverty work, the Foundation recently launched Ending Poverty: America’s Silent Spaces, a four-year national initiative to examine barriers and identify solutions to reduce hardship among our most vulnerable citizens. As part of the initiative, Smiley will embark on a series of town halls across the country, beginning June 26th in Los Angeles. Smiley is CEO of The Smiley Group, Inc., which serves as the holding company for various enterprises encompassing broadcast and print media, lectures, symposiums, book publishing, and digital platforms. The Hollywood Walk of Fame is an internationally-recognized Hollywood icon. With approximately 24 star ceremonies annually broadcast around the world, the constant reinforcement provided to the public has made the Walk of Fame a top visitor attraction. The Hollywood Chamber of Commerce continues to add stars on the Walk of Fame as the representative of the City of Los Angeles. The Walk of Fame is a tribute to all of those who worked diligently to develop the concept and to maintain this world-class tourist attraction. The Walk of Fame is open to the public. No paid admission or assigned seating at star ceremonies. It is understood that the cost of installing a star on the Walk of Fame upon approval is $30,000 and the sponsor of the nominee accepts the responsibility for arranging for payment to the Hollywood Historic Trust, a 501(c)3 charitable foundation. The funds are used to pay for the creation/installation of the star and ceremony, as well as maintenance of the Walk of Fame.